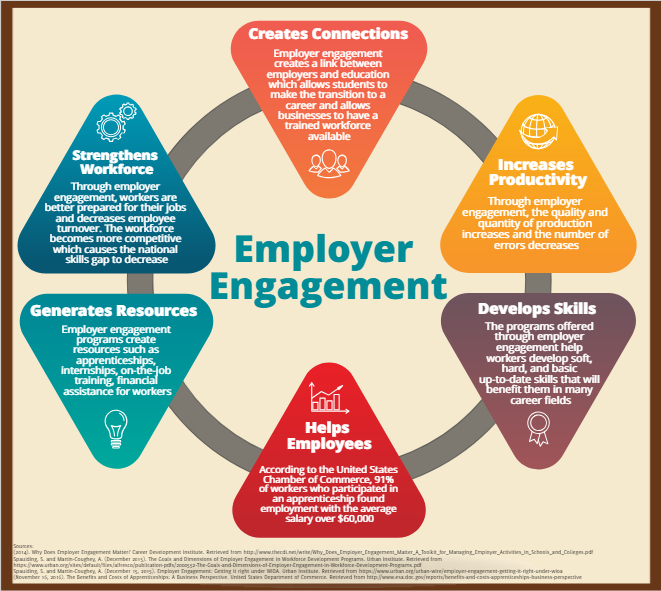 Employer engagement creates a network between education and businesses and helps the education reflect the up-to-date skills needed by employers. There are many ways that businesses can engage in employer engagement such as oversight, program design, program delivery, and recruitment and hiring (Spaulding and Martin-Coughey, December 2015, pg. 8). In employer engagement, businesses interact with schools to set up apprenticeship and internship programs for students. These programs give students training and strengthen their soft skills. Workers develop basic, soft, and hard skills through employer engagement. The basic skills provided by education are beneficial in all fields of work and create a foundation for hard skills. Through training, students develop soft skills such as employee engagement, flexibility in skills, and problem-solving (The Benefits and Costs of Apprenticeships). The strong foundation of basic and soft skills prepares the employees for the specific or hard skills needed for their job. These skills increase the quality and quantity of a product as well as reduce the number of errors during production in industries such as manufacturing. For employer engagement to be effective, employers must focus on the current condition of the industry and help workers develop the skills needed for the constant changes (Johnson, 2018). Businesses must work with workforce programs and educational systems to understand and train future employees. Businesses must support curriculum development and become involved in their future workers’ training. Through collaboration, employers find workers that are ready and fit to work. One example of a change made in industry is the advancement in technology. By having workers prepared to work with advanced technology, a business can stay competitive in the market. Employer engagement increases productivity and prepares businesses for the future. Employer engagement requires businesses to interact with employees, educational systems, and workforce programs. By working together, employers can meet the needs of the workforce by helping educational systems train future workers to fit the industry’s needs. According to the United States Department of Commerce, 91% of apprenticeships lead to employment opportunities (The Benefits and Costs of Apprenticeships). This shows that employer engagement is beneficial and helps strengthen the economy. To increase supply of graduates or certain skills. To improve productivity or ways of working. To widen access through lifelong learning. To help create and apply new knowledge. Business leaders play a role in the P-20W continuum because they need workers with up-to-date skills to fill open positions and keep pace with changes in their industries. Many employers are struggling to find qualified workers and they are unsure of whether education and training providers are preparing enough people with the right skills to meet current and future industry needs. Hard skills are technical skills or applied knowledge specific to an industry, occupation, or job. Soft skills are employability skills generally needed to succeed in the work environment, including communication skills and teamwork. Basic skills are academic or foundational skills, such as reading, math, computer proficiency, and English fluency. Enhancing student employability, through creating a suitably skilled graduate population, in response to the demands of the economy. Creating opportunities for the development of the workforce, through access to skills development opportunities. Creating opportunities for higher education providers to offer research and consultancy services to businesses, typically as part of collaborative and partnership arrangements associated with enterprise and innovation initiatives. The enhancement of student employability through the opportunity to gain industry/ work-relevant skills, experience and knowledge, and in some cases professional qualifications and accreditation, as part of programs of study. The creation of ‘work-ready’ graduates for employers, equipped with the skills, knowledge and experience required for the workplace. Workforce development, providing the current and potential workforce with opportunities for developing their skills through a variety of high-quality flexible study opportunities, delivered in response to need and demand. The opportunity for research, collaboration and consultancy, and access to services and facilities, as part of income generation and knowledge transfer. Apprentices enter into a structured training program of classroom and paid on-the-job training under the guidance of a mentor. As their skills increase, so do their wages. Upon completion of the program, apprentices earn an industry-recognized credential and usually are hired into a job that marks the start of a career. The payoff for workers is clear: 91 percent of apprentices find employment after completing their program, and their average starting wage is above $60,000. On the positive side, employers are increasingly coming to understand that their business needs are best met when they are engaged in the workforce system. They know they need to be a part of the system in order for it to work for them. What they need from workforce programs is to feel like they are offering them a real partnership in addressing workforce needs for both members of the community and the businesses that employ them.